I went to the world premiere of this documentary which was bittersweet. For those unfamiliar, Rob Stewart, who made this film, passed away while filming last year. He was diving in Florida, and his equipment malfunctioned. With the help of a lot of people, going through hours and hours of videos, they were able to complete the documentary that Rob sought out to make. His parents and sister spoke at the screening. I had seen his first film, Sharkwater, several years ago. It was a beautiful and sad film. Rob wanted to show the world that sharks are not the killers people make them out to be, and so he went swimming with them to show how gentle they are. He wanted the world to see sharks and feel for them the way people do for other animals. He mentions that when an elephant is killed there’s an outcry, but when sharks are killed no one cares. He mentions that elephants have killed a lot more people than sharks have. While filming Sharkwater, he found out about the shark fin trade and the documentary wound up incorporating that as well. 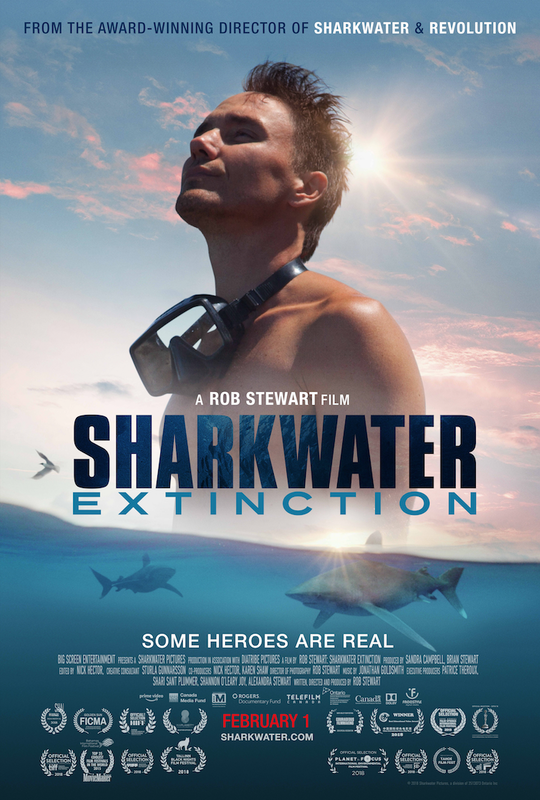 Sharkwater Extinction is a continuation of that. Rob had found out that while many countries had banned the killing of sharks for their fins since the release of his first documentary, it was still happening anyway, only it had now become an underground operation. He filmed in various places around the world from Costa Rica to Miami to show that the shark fin trade is very much alive and a huge industry. It was hard for me and others (I saw many turn away when I did) to see sharks being captured, their fins being cut and their carcasses thrown back into the ocean. It’s an eye opener when he tests things people regularly buy, and found that there are traces of shark fins in pet food, regular cans of fish food that people buy, and even cosmetics. This documentary shows what a hero Rob was. It was heartbreaking to watch knowing his life was cut short too early. You can see what a good heart he had. I don’t think there was a dry eye in the house. There was a standing ovation and people kept applauding well after the credits ended. A must see to both be educated on this horrible billion dollar industry, and to see Rob swimming peacefully with the sharks and fighting to save their lives.